When he signed into law the bill that reduces the disparity in penalties for crack and powder cocaine offenses, President Barack Obama narrowed the "racial" gap in drug sentencing Tuesday by some 82 percent. Yet he did not close it. Civil rights leaders that struggled mightily for parity under this unjust federal policy, which filled the prisons overwhelmingly with blacks, are premature in celebrating a total victory. While an improvement, this new legislation now punishes crack cocaine offenders — that cops racially target among black users and sellers in the first instance — by a ratio of 18:1, as compared with those abusing powder cocaine. On the presidential level, this achievement, as with the health care bill, is another example of Obama surpassing Bill Clinton's failed efforts, this time in the crucial criminal justice area affecting mainly African Americans. 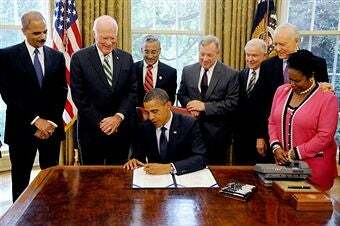 As such, unlike with the health care bill affecting all Americans, the first black president, it was noted, made no public comment during the bill signing. Savvy political observers understand Obama's public reticence on such controversial matters, given white denial about racism. However, it allows his critics, black and white, to downplay this breakthrough and continue harping about his alleged lack of sensitivity, especially in the wake of the Shirley Sherrod affair. In a rare show of bipartisanship, the Fair Sentencing Act was passed by a Congress that Obama and his attorney general managed at least to tilt toward fair sentencing. The bill revokes a five-year mandatory sentence for first offenders, and instead of 5 grams of crack drawing the same mandatory sentence as 500 grams of powdered cocaine, the new minimum for rock has been set at 28 grams. The draconian 100:1 ratio of crack to powder has thus been reduced to a less cruel but still unjust bias of 18:1. Once again, the promise of equal justice remains evasive under the peculiar legislative-judicial system that moves like a glacier when it comes to dispensing parity between white and black citizens. Contrary to law-enforcement assumptions, some 24 percent of crack cocaine users were reportedly black, and 72 percent were Latino or white, according to a statistical study of 198 counties comprising more than 50 percent of the nation's population. Yet, the Justice Policy Institute says, "More than 80 percent of defendants sentenced for crack cocaine offenses were African Americans." Furthermore, the institute revealed a national disparity in incarceration rates for drugs overall, despite a pattern showing no appreciable difference between whites and blacks in illegal-drug possession, use and sale. Some 8.5 percent of whites were found to use illicit drugs in '02, compared with 9.7 percent for blacks. Despite this similarity, blacks, the report found, were "admitted to prison for drug offenses (at) nearly 10 times the rate for whites." When signing the omnibus crime bill in his first term, President Clinton left the 100:1 ratio intact, despite the staggering numbers of blacks being hauled off to prisons. This crackdown on young, first-time, nonviolent offenders during the Clinton years was devastating. Black juveniles charged during that period jumped to 535,500 in 2000 from 456,072 in 1992. During the same period, black adults in the criminal justice system increased by 276,700 to 2,149,900, most of them drug offenders. During a White House interview, I once asked President Clinton about this racially biased 100:1 cocaine sentencing disparity he had approved. "The situation that exists is unfair, unjustifiable and should be changed," he said. Yet Clinton found no way to change it when he was in the White House. Instead, he resorted inanely to petitioning the incoming Bush administration to correct this policy of racial bias. The majority opinion of Justice Ruth Bader Ginsburg denounced the shaky foundation upon which Congress drafted the '86 bill. It was based upon the false assumptions, for example, that crack offenders were more likely to be violent, that crack was significantly more dangerous and addictive than powder, and that "crack use was especially prevalent among teenagers." The U.S. Sentencing Commission had already concluded that "crack cocaine has not caused the damage that the Justice Department alleges it has." Also, credible medical researchers and criminal justice experts have firmly established that there is no appreciable difference between the effects of crack and powder cocaine use, and the majority of those trafficking in both forms of the drug are nonviolent. Yet, even though blacks make up less than a quarter of crack users, some 85 percent of convicted federal crack offenders are black. The racial disparity starts with the arresting officer long before the federal judges peer down at crack offenders they still feel mandated to punish 18 times more severely than someone caught with powder. The Fair Sentencing Act is not fair. It should be made retroactive, and crack offenders should be punished the same as those convicted of abusing powder cocaine. Les Payne is a Pulitzer Prize-winning journalist and a frequent contributor to The Root.